Medieval writers were keenly aware of the power of words. Before the late 4th century, an industrious but unnamed writer penned letters between St Paul and Seneca, a Roman philosopher. St Jerome mentioned the letters and included Seneca in his list of Christian authors. Full of contemporary names and references to events during the reign of Nero, the correspondence was widely accepted and even popular, with many manuscripts surviving from the 12th to 15th centuries. 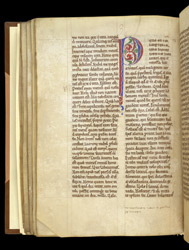 This manuscript has an inscription that it belonged to the Benedictine abbey of St Peter, in Gloucester. Authentic letters of Seneca to his friend Lucillius do survive. The collection of letters to Paul includes some of Seneca to Lucillius, such as the one starting with the large 'P'.